Bloom & Grow is excited to collaborate with Itsy Bitsy to present 12 Masterclasses as a part of the Itsy bitsy’s Creativity Carnival on the 7th, 8th and 9th of December in Bangalore. Artist of the Masterclass – Tracey Sabella, an experienced crafter from the USA. 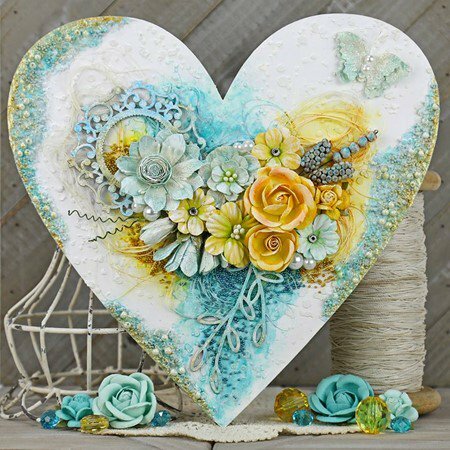 Join her workshop to enjoy wonderful practical learning exposure as you build a gorgeous Shabby Chic Altered Wooden Heart. 1. Principles of composition, balance, and design. 2. to learn various mixed media techniques for creating background with stencils, various mediums, textures, triangle tools, pastes and paints. 3. Techniques with stamps, ink, texture paste, and stencils. 4. Working with pretty Little Birdie handmade flowers, metal micro-beads, pearl beads, chipboards, colourful embellishments and much more. 1. Gorgeous altered 10×10 inch wooden heart to be used a home décor piece or gift. You also get 3 entry tickets free with 1 masterclass ticket. 1. All materials for the workshop will be provided by Team Itsy Bitsy at the venue.